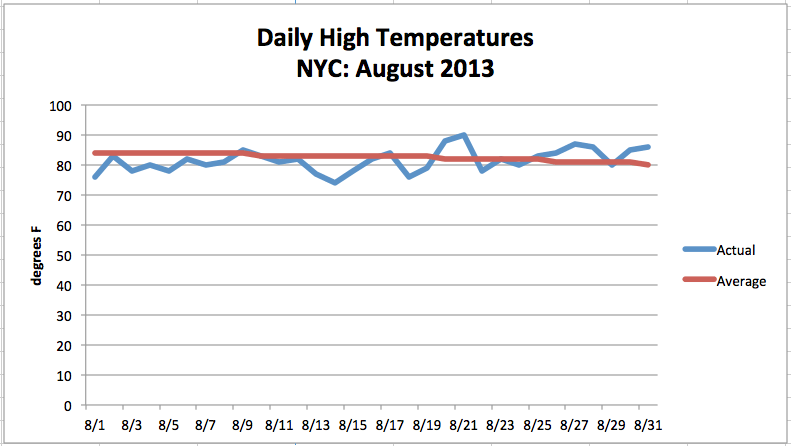 In spite of getting off to a cool start, August hovered around average in New York City this year. Nineteen out of thirty-one days posted below average temperatures, but one day reached the 90°F mark. All together, the city’s average monthly temperature was 74.6°F. That is only 0.4°F below normal. In terms of precipitation, NYC was mostly dry. Despite a few heavy downpours, the city only collected 2.85 inches of rain in Central Park. That is 1.59 inches below normal. This was the second month in a row that we received below average rainfall.